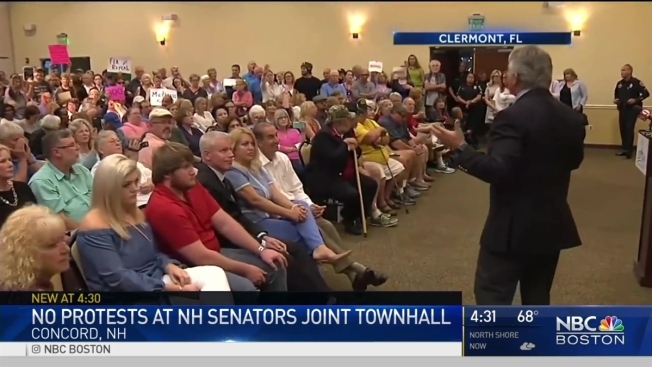 Same lawmakers leaving D.C. during this week’s recess are facing hostile homecoming, but quite the contrary in New Hampshire as democratic senators Jeanne Shaheen and Maggie Hassan hosted their first town hall since Election Day. More than 200 people packed the auditorium at NHTI in Concord. There was a passionate discussion, but no fireworks. “It’s the New Hampshire way, we talk with politicians and candidates all the time, we have respectful debates and let them know how we’re feeling,” said Jenny Foster of Hopkinton. It’s quite a contrast from what we’ve seen at other town hall events across the country this week. Angry constituents interrupting town halls, challenging Republican lawmakers who are backing President Trump’s agenda. And in Concord, some expressed similar fears. “I represent an entire congregation and they’re really scared,” said Julie Lombard on Atkinson. But the tone was more supportive as voters had a candid conversation with their two democratic senators. Foster brought her little girl, telling us she comes to these events to show her children that in America, if you don’t like something, you have the power to change it. “This is how we protect our country, this is how we stand up for what we believe,” Foster said. In a tweet this week, President Trump blamed liberal activists for the angry crowds. We likely won’t see that in the state because the state has an entirely democratic delegation.